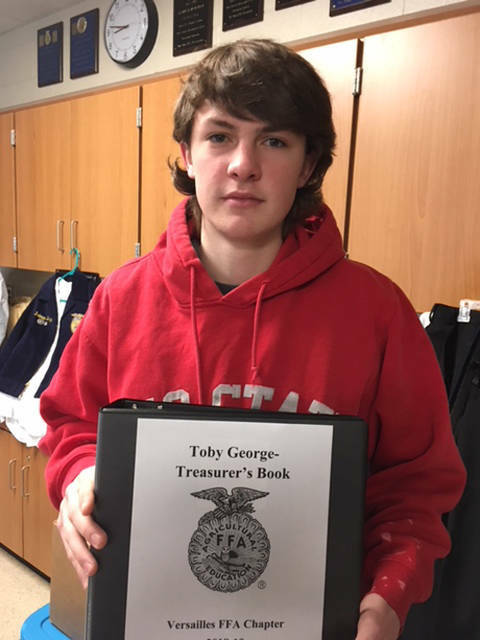 Versailles FFA Treasurer Toby George is shown with his 100 percent Gold Rated Treasurer’s book that he submitted to the state. Versailles FFA members who earned their state degree include (l-r) Caden Buschur, Deanna Hesson and Ian Gehret. 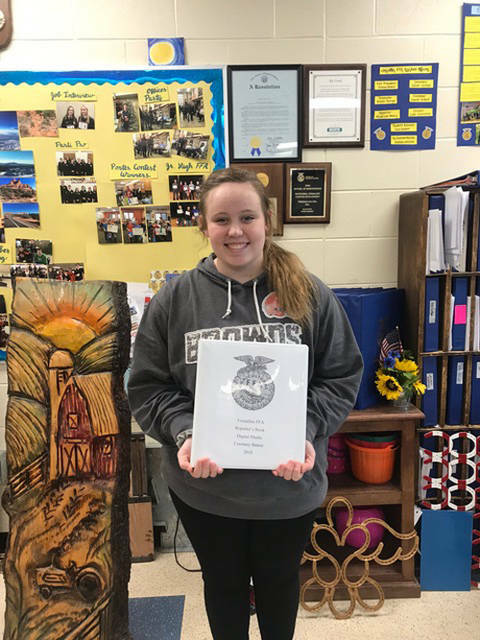 Versailles FFA Secretary Deanna Hesson earned a Gold Rating and a 100 percent on her Secretary’s book that she submitted to the state FFA. Versailles FFA members (l-r) Troy May and Austin Timmerman both received their state degrees. FFA member Jon Gehret earned his state degree and will be recognized at state convention. Versailles FFA member Jacob Wuebker (left) is shown holding his State Star Placement application and his proficiency award applications. Member Cole Luthman (right) is shown holding his proficiency award application. Versailles FFA Reporter Courtney Batten is shown with her 100 percent Gold Rated Scrapbook and Reporter’s book that was submitted to the state. FFA member Noah Barga is shown with his Proficiency award in the area of goat production. Versailles FFA member Kimberly Winner is shown holding her state degree and will be recognized at state convention in May. VERSAILLES – The Versailles FFA participated in the regional FFA evaluations on Jan. 31. Officers who submitted officer books included Courtney Batten, Gold Rated Reporter’s Book and Scrapbook, which received a 100 percent; Toby George, Gold Rated Treasurer’s Book, which received a 100 percent; and Deanna Hesson, Gold Rated Secretary’s Book, which received a 100 percent. Batten, George and Hesson will be recognized at the State FFA Convention. The Versailles FFA Chapter also submitted eight State FFA Degrees. All applications passed regional evaluations and were submitted to the state FFA evaluation. Members who submitted State FFA Degree applications included Caitlyn Luthman, Caden Buschur, Kimberly Winner, Deanna Hesson, Troy May, Ian Gehret, Austin Timmerman and Jon Gehret. The State FFA Degree is the highest degree the state can bestow on its members. The Versailles FFA Chapter also submitted five American FFA Degree applications. Their applications passed regional evaluations and now will continue on to state evaluations. The American FFA Degree is the highest degree that the National FFA Organization offers. Members who submitted the American Degree application included David Barlage, Sean Besecker, Jamie Hart, Isaac Gehret and Sarah Gigandet. The Versailles FFA Chapter also submitted five FFA Proficiency Award applications. Members who submitted Proficiency Applications that will continue on to state evaluations include Cole Luthman in Poultry Production and Noah Barga in Goat Production. Jacob Wuebker also had three proficiency award applications in the area of Diversified Agriculture, Diversified Livestock Production and Diversified Crop Production. Wuebker also applied for the Star in Ag Placement award. 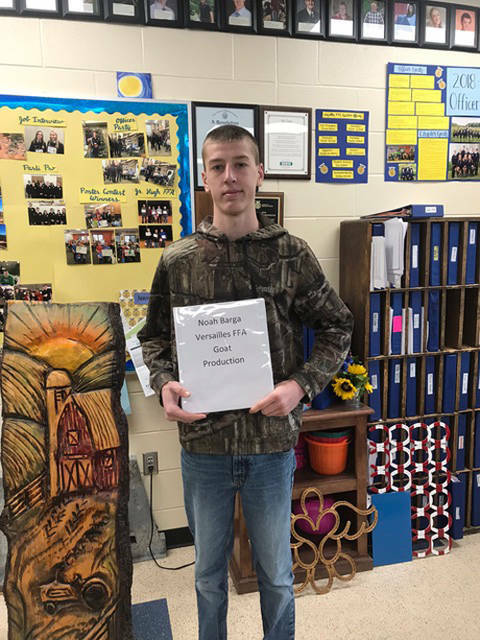 https://www.dailyadvocate.com/wp-content/uploads/sites/34/2019/02/web1_WEB-IMG_4657.jpgVersailles FFA Treasurer Toby George is shown with his 100 percent Gold Rated Treasurer’s book that he submitted to the state. 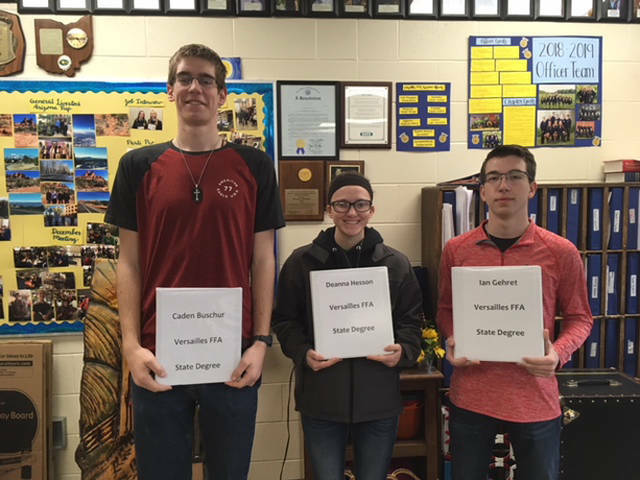 https://www.dailyadvocate.com/wp-content/uploads/sites/34/2019/02/web1_WEB-IMG_4660.jpgVersailles FFA members who earned their state degree include (l-r) Caden Buschur, Deanna Hesson and Ian Gehret. 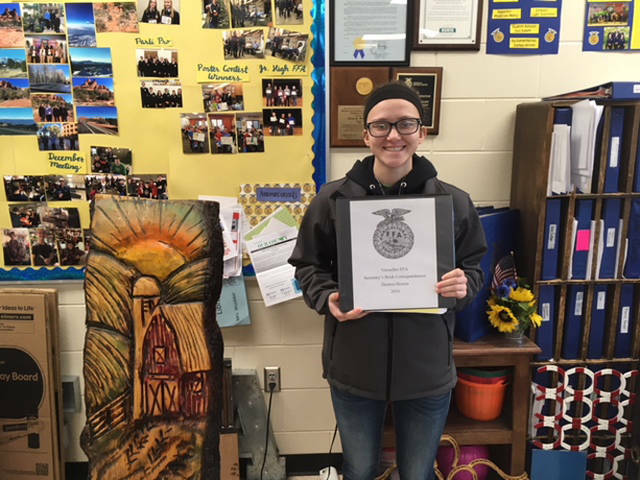 https://www.dailyadvocate.com/wp-content/uploads/sites/34/2019/02/web1_WEB-IMG_4662.jpgVersailles FFA Secretary Deanna Hesson earned a Gold Rating and a 100 percent on her Secretary’s book that she submitted to the state FFA. 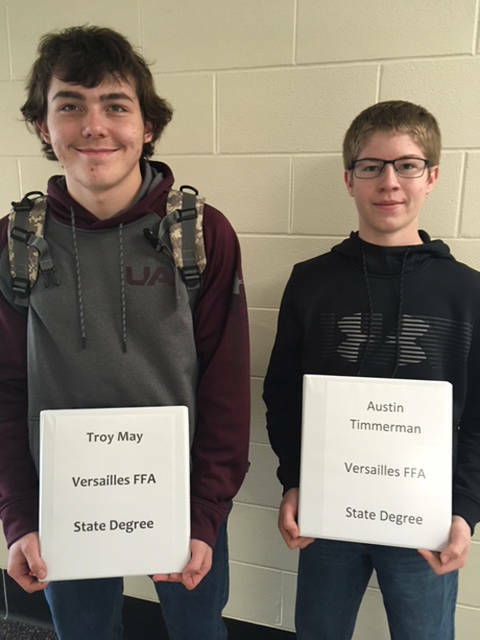 https://www.dailyadvocate.com/wp-content/uploads/sites/34/2019/02/web1_WEB-IMG_4664.jpgVersailles FFA members (l-r) Troy May and Austin Timmerman both received their state degrees. 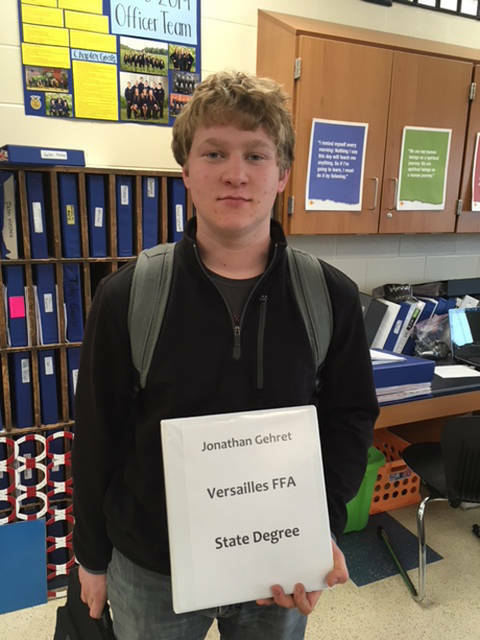 https://www.dailyadvocate.com/wp-content/uploads/sites/34/2019/02/web1_WEB-IMG_4667.jpgFFA member Jon Gehret earned his state degree and will be recognized at state convention. 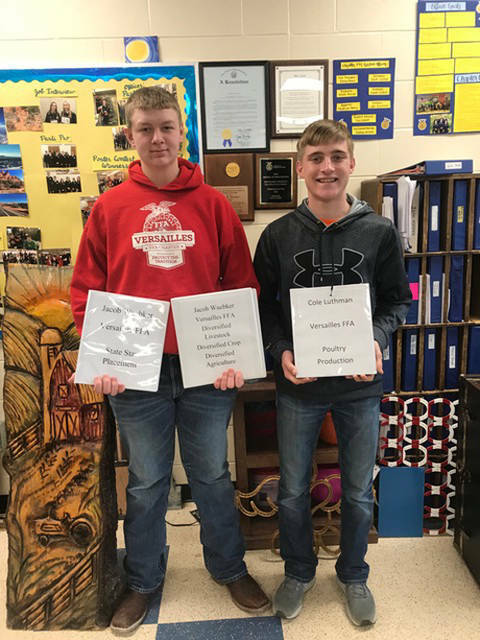 https://www.dailyadvocate.com/wp-content/uploads/sites/34/2019/02/web1_WEB-IMG_4669.jpgVersailles FFA member Jacob Wuebker (left) is shown holding his State Star Placement application and his proficiency award applications. Member Cole Luthman (right) is shown holding his proficiency award application. https://www.dailyadvocate.com/wp-content/uploads/sites/34/2019/02/web1_WEB-IMG_4672.jpgVersailles FFA Reporter Courtney Batten is shown with her 100 percent Gold Rated Scrapbook and Reporter’s book that was submitted to the state. https://www.dailyadvocate.com/wp-content/uploads/sites/34/2019/02/web1_WEB-IMG_4673.jpgFFA member Noah Barga is shown with his Proficiency award in the area of goat production. 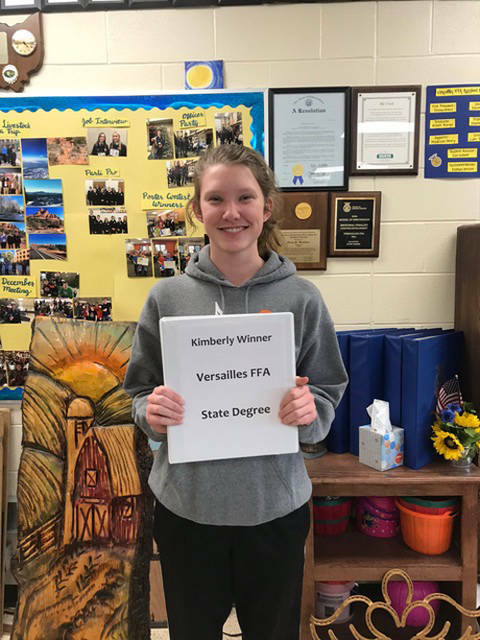 https://www.dailyadvocate.com/wp-content/uploads/sites/34/2019/02/web1_WEB-IMG_4674.jpgVersailles FFA member Kimberly Winner is shown holding her state degree and will be recognized at state convention in May.